Just wanted to share an image I recently shot while on assignment. 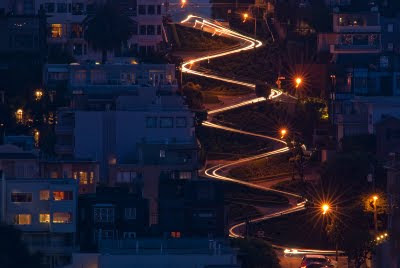 I was hired to capture an image of Lombard Street in San Francisco – best known for its one-way section on Russian Hill (between Hyde & Leavenworth Streets)- eight sharp turns (or switchbacks) that have earned Lombard the distinction of being “the crookedest street in world (part of The Presidio and Cow Hollow neighborhoods). I traveled to the city one day after scouting some locations on Google Earth (that’s right, sign of the modern age) and spent an afternoon picking the best spot to shoot from. Knowing the light could look nice at sunrise yet most likely devoid of vehicles, I choose to shoot in the late afternoon – not only to catch the hill in shade, slightly backlit, but also hoping the sun would reflect off of the street to help it stand out. I shot from a few locations, one close to the actual street, others miles away. Using a 300mm lens with a 1.4 teleconverter and my digital 35mm SLR, I was able to crop the street nicely from one of my vantage points on Telegraph Hill. Although I mounted my lens on a large Gitzo tripod, I still set the mirror lock feature and shutter timer to keep the camera as steady as possible – afternoon winds blowing atop the hill made me worry about camera shake. Once again proving photography, as all art, is subjective.